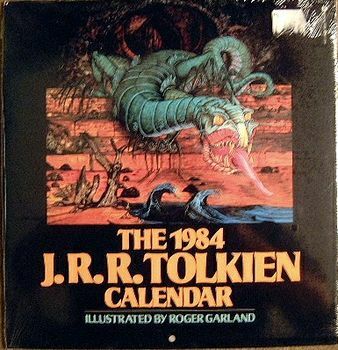 The lean years for Tolkien calendars: two issues in 1982, one in 1983, and five in 1984. 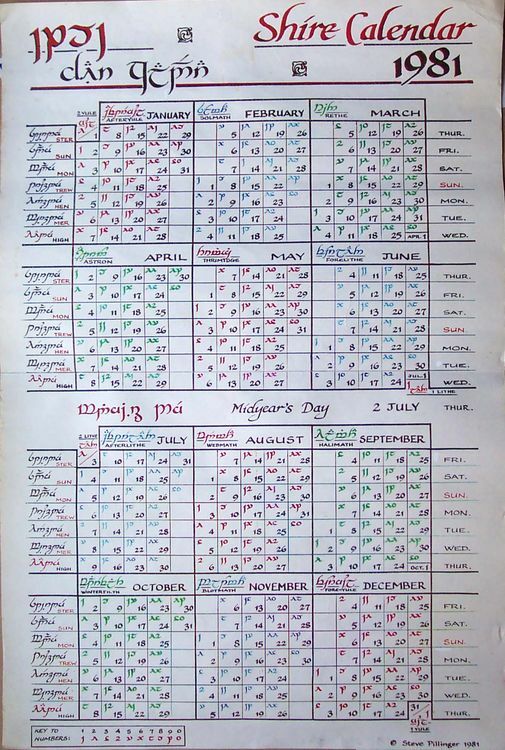 Contains the rare Pillinger Shire Calendars. 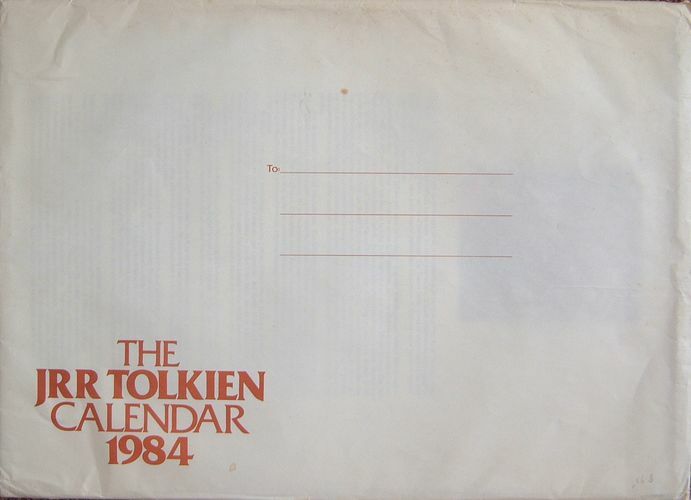 Tolkien calendars were essentially not issued at all in 1983. 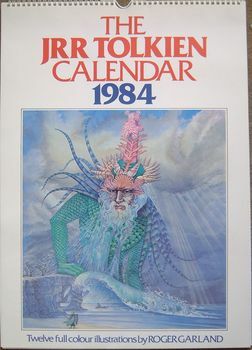 While the Antioch 1983 Fantasy Calendar is listed, it contains only a single Tolkien-related illustration (as noted in its entry below). 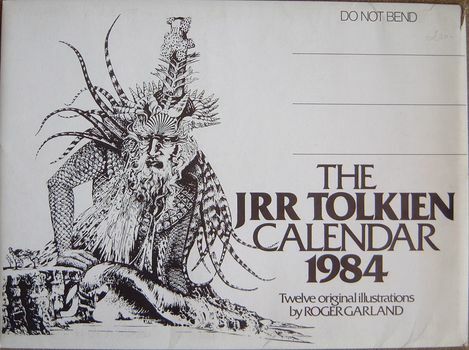 “The 1981 J.R.R. 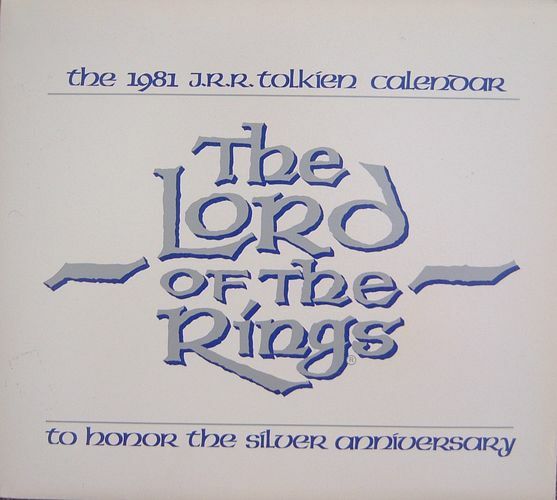 Tolkien Calendar The Great Illustrators Edition” Illustrations by five artists. Dimensions: 13 x 12.25 inches (w x h); stapled; punched hanging hole; shrinkwrapped. “The 1981 J.R.R. 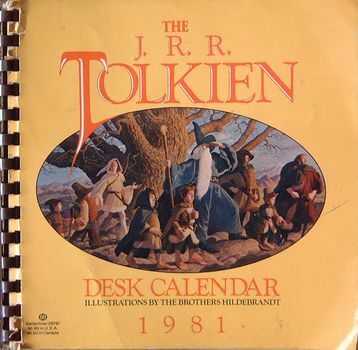 Tolkien Desk Calendar” Illustrations by the Brothers Hildebrandt (previously published in the calendars noted above). Dimensions: 8 3/8 x 8 inches (w x h); plastic comb bound. VARIANT: “The 1981 J.R.R. 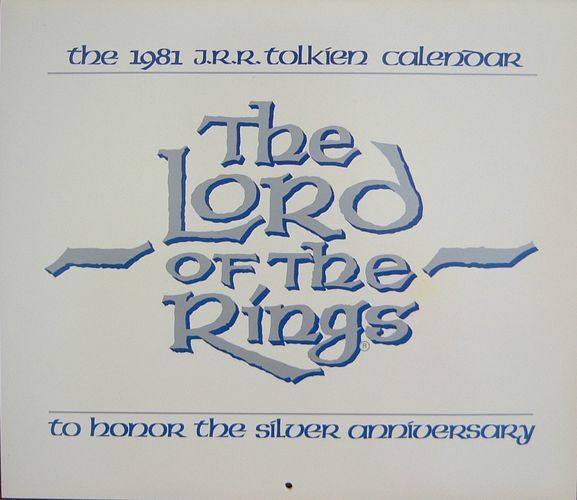 Tolkien Calendar – The Lord of the Rings - To Honor the Silver Anniversary” Illustrations by Paul Rivoche loosely based on images from the Ralph Bakshi film. Dimensions: 13 x 11.75 inches (w x h); stapled; punched hanging hole; glossy white, medium-weight paperboard sleeve; shrinkwrapped (Technically, it's not a flexible, plastic shrinkwrap. The wrap is cellophane-like and rather brittle. It is therefore difficult to find one still in the wrap because of its age and the fact that the cellophane splits because of its brittleness). 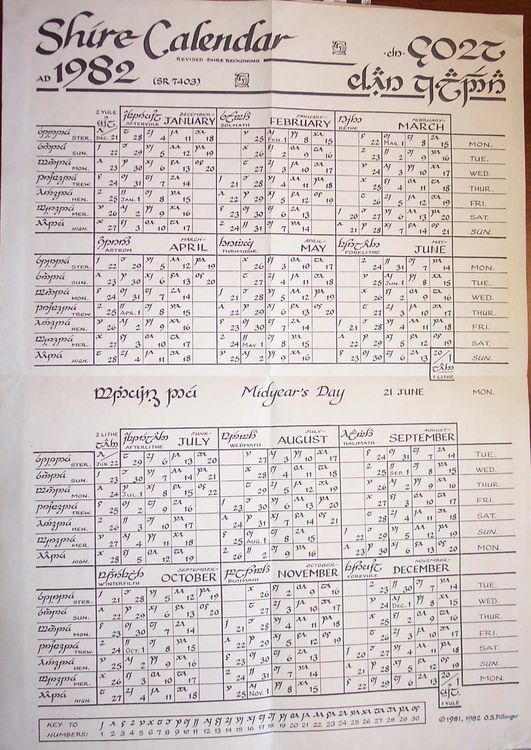 "Shire Calendar 1981" Steve Pillinger, UK. Three versions exist: A3 size, color; A3 size, black and white; A4 size, black and white. Rarity: 9 May appear on ebay only once a year. “The 1981 J.R.R. 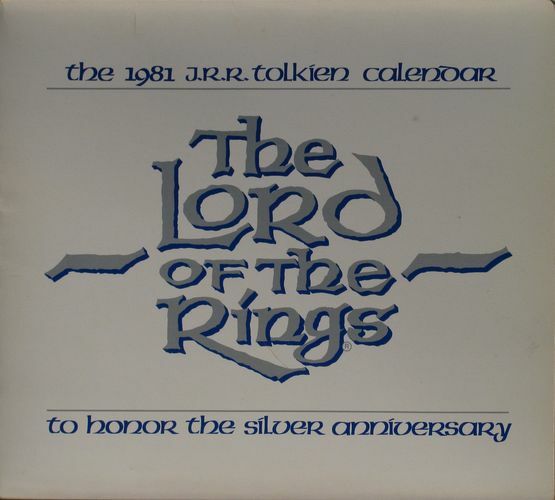 Tolkien Calendar – The Lord of the Rings - To Honor the Silver Anniversary.” Illustrations by Paul Rivoche loosely based on images from the Ralph Bakshi film. Dimensions: 13 x 11.75 inches (w x h); stapled; punched hanging hole; glossy white, medium-weight paperboard sleeve; shrinkwrapped (cellophane-like; same comments as for the Methuen issue above). "The 1982 J.R.R. 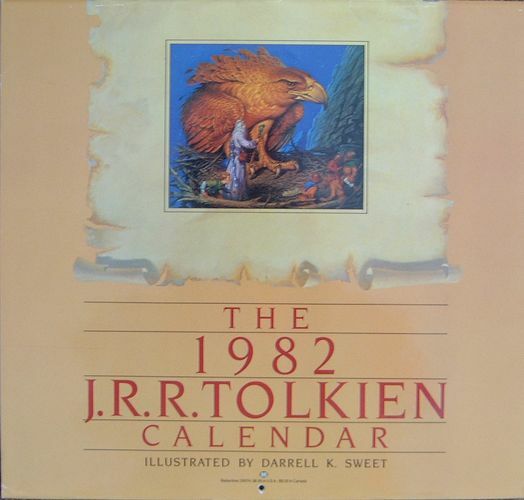 Tolkien Calendar" Illustrations by Darrell K. Sweet. Dimensions: 13 x 12.25 inches (w x h); stapled; punched hanging hole; shrinkwrapped. 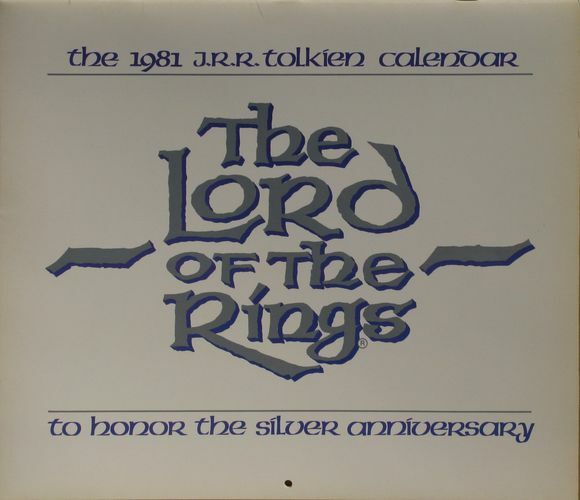 "Shire Calendar 1982" O.S. Pillinger, UK. Two versions: A4 size, A3 (297 x 420 mm) size (shown here); both in black and white. Rarity: 10 Unknown how many were made; the few that I know of are in the hands of collectors or Marquette University. 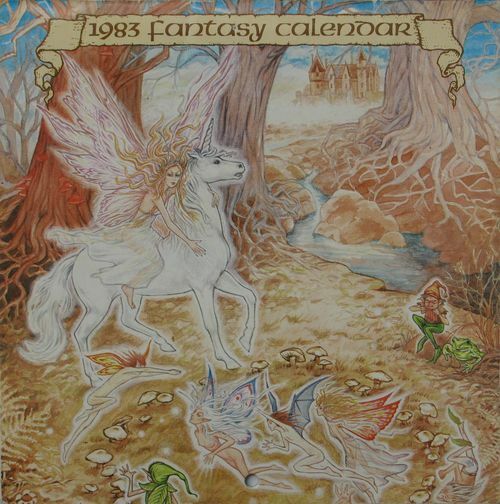 "1983 Fantasy Calendar" The ONLY Tolkien-related calendar issued in 1983. Even then, only a single illustration pertains (July: "Gandalf's Visit" by Sylvia Thomas.) Color illustrations. Dimensions: 5.75 x 5.75 inches (w x h); stapled; mailer. "The 1984 J.R.R. 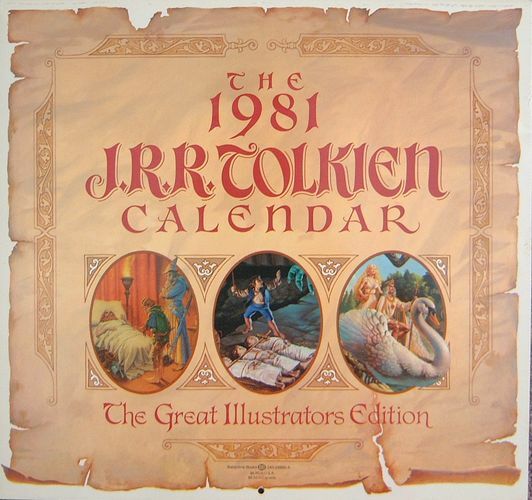 Tolkien Calendar" Illustrations by Roger Garland. Dimensions: 11.5 x 12 inches (w x h); stapled; punched hanging hole; shrinkwrapped. 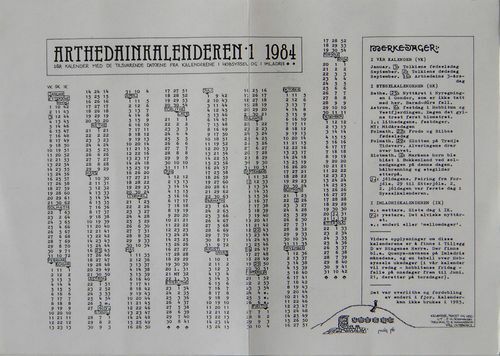 1984 Friends of the Earth (New Zealand) Ltd.
"Arthedainkalenderen.1 1984" Single page insert into the the November 1983 issue of "Angerthas 9", fanzine of Arthedain, Norge Tolkien Forening. Gregorian, Shire, and Imladris reckonings. For those not fluent in Norwegian, read Varnafindë's translation of it. Dimensions: 11 3/4 x 8 1/2 inches (w x h). "The J.R.R. 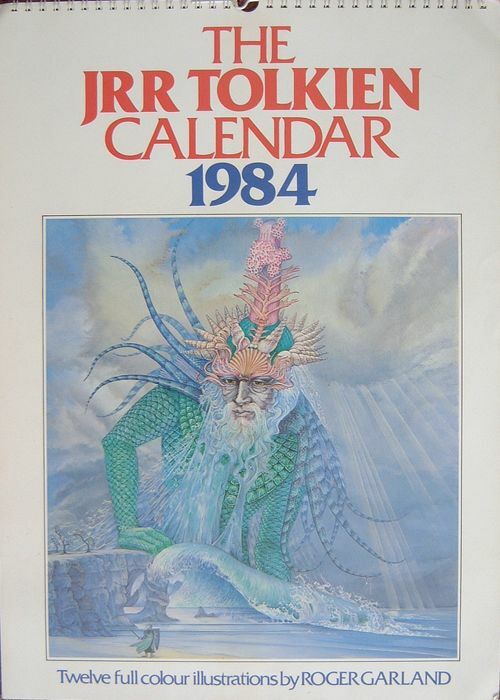 Tolkien Calendar 1984" Cover: “Ulmo, Lord of the Waters.” Illustrations by Roger Garland. 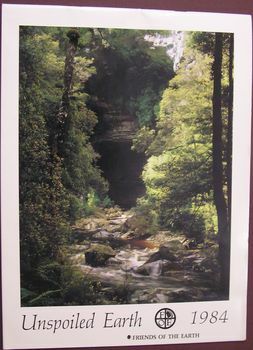 Dimensions: 12 x 16.5 inches (w x h); wire bound; heavy wire hanging loop; medium-weight paperboard mailer/envelope printed with theme similar to the cover of the calendar.